Big things happening this year!! The TLDP has purchased our first motorbike, a Yamaha XTZ. This will be for Nico to use while he works for us. Nico was previously using his scooter to get to work and around the Liquiça district. Scooters are more commonly used in TL because they are less expensive to buy; however they are not very hardy and although they work well on the streets of Dili, they soon come to grief on the rough roads outside the capital. We are very happy that Nico will be on a more reliable vehicle, and Nico is super-happy because he has a new toy! Team 4 will farewell Australian shores next Saturday. Team Leader, Dr Peter Shakes will be joined by Dr Ashley Freeman and Dr Andrew Frame in the first week, who will then be replaced by the redoubtable Dr Mary Tuituinnik in Week 2. The Timorese team members include Nico Pires, TLDP’s hard-working dental therapist and new Dad, and Ana Paula Dos Santos Tavares Salgado, the team’s translator and dental assistant. Team 4 has already been plagued by misdirected supplies, team members dropping out, and confusion with scheduling;. Hopefully, all the wrinkles have been ironed out now and this team will have some smooth sailing once they get to TL. They are heading to Atsabe and Maubara. Good luck and have fun Team! It seems that the years fly by faster and faster as we get older. Here we are again at the end of the year, with the silly season looming. At this time, I reflect upon everything that has happened during the year – good and bad – all our achievements, all our losses, and how we have handled it all. 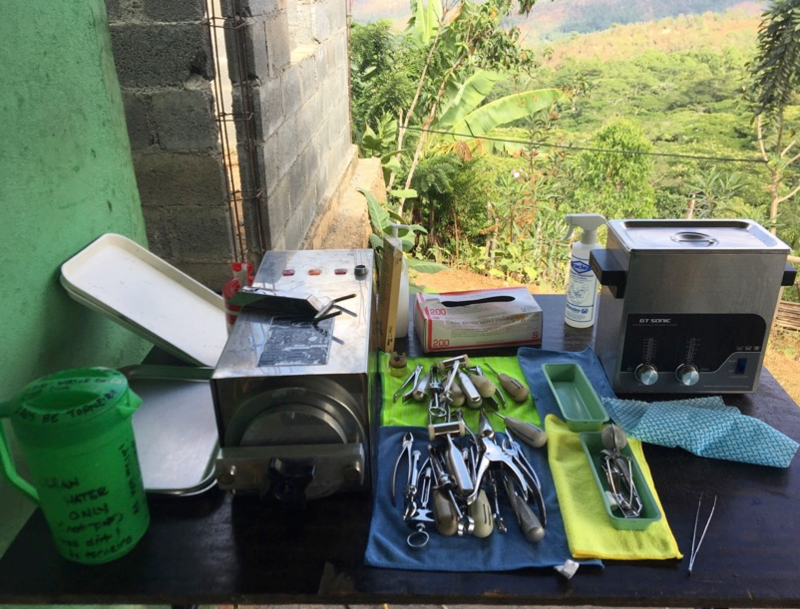 This year has been tumultuous for the Timor Leste Dental Program; we hired a new dental therapist, Nico Pires, at the beginning of the year, in a bid to increase the local ownership for the program. He has proved to be a true asset – a hardworking and competent clinician, who is unafraid to take charge even in the presence of some extremely authoritative (bossy) Aussie dentists. We simultaneously entered into a partnership with the Maubisse-Bendigo Friendship Association, which has increased the support for the Maubisse District, but has also had the effect of increasing (temporarily, we hope!) our workload, as we bring these newcomers up to speed. Maubisse Hospital acquired a new dentist – Dr Inda Zulmira Días – who has already shown her skill in organising the Maubisse sectors for Teams 1 and 5, as well as an ability to connect with the community though our dental workshops. Everyone who got to work with her this year fell in love with her charm and enthusiasm. Overshadowing everything was a great deal of frustration dealing with the moving goal posts of the new Timorese dental registration process – delays, lengthy meetings with government officials, multiple trips to Dili, mountains of paperwork, and emails, and submission and resubmission of documents…this is still ongoing. All the teams felt the absence of our translator, and friend, Bony, who was in his final year at university. Although he couldn’t work with the teams, he still set aside time to help the TLDP with the registration, as well as sorting out many other details for our teams. Thank you Bony! The TLDP sent over 5 teams this year. We had a host of new volunteers – Dr Mary Tuituinnik, Dr Marius Mocke, Mrs Yvette Young, Ms Abbey Notley, Ms Liz Thompson, Dr Mengzhu Wang, Ms Malita McCabe, Dr Andrew Frame, Dr Phil Hill and Dr Christine Underhill. 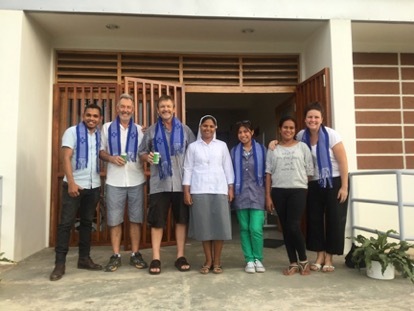 It was wonderful to see the way these new volunteers took the Timorese people into their hearts. We also saw the return of our regulars – Dr John Moran, Dr David Digges, Dr Wayne Pearson, Dr Karen Sloan, Dr Geoff Knight, Dr David Sheen, Dr Blanche Tsetong, Ms Bella Miller, Dr John Whyte, Dr Ashley Freeman and Dr Peter Shakes. The people who return, year after year, is what keeps this program running. They are gold. 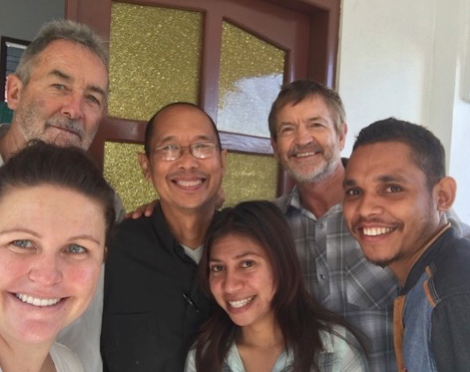 Sadly, two of our team leaders, Wayne Pearson and David Sheen, claimed that this was their so-called ‘last’ trip to Timor; however, it is hard to resist Timor’s siren song – we think that Timor hasn’t seen the back of them yet! However, by far the biggest blow to the program this year, was the loss of Sr Filomena da Costa – our Timorese Program Coordinator. The Carmelite exec ruled that she had to move to Oecusse to head the community over there; as a relatively young community, they need someone with her 26 years of experience. In one fall swoop we have lost our boss, the best chef in Timor, our spiritual advisor, local folklorist and a quirky, mischievous friend. No prizes for guessing that everyone will be vying for the Oecusse spot from now on! Nico and Sr Joaninha have big shoes to fill. This year the TLDP treated over 2330 people; we extracted over 1851 teeth, placed over 937 fillings, and carried out 411 preventive treatments. This treatment is worth about $977,650. We facilitated one dental workshop and mentored 6 Timorese dental clinicians over a period of 10 weeks. We would like to wholeheartedly thank all our fabulous volunteers, who never stint on giving their time and effort to the Timorese people. We would also like to thank their families and friends who support them – they would not be able to do what they do without you. Thank you to all our Timorese workers, partners and helpers. There are always a multitude of local people, often unsung and unseen, who help keep the program running while we are over there – they are teachers, drivers, groundsmen, elders, nurses, passersby – they give because they can, and we are awed by them. A massive thank you to Henry Schein Halas and SDI for their extremely generous donations to our program this year – we would not be able to function without your donations of vital dental materials and equipment. Last, but not least, thank you to our donors – 97% of your valuable contributions go directly towards helping the Timorese people. We are more than grateful for your support. Your contributions pay for equipment and vehicle maintenance, for material and equipment purchases and for the salaries of Nico and other Timorese translators and fixers. Thank you. Thank you. Thank you. From all of us at the Timor Leste Dental Program, we wish all our volunteers, our supporters, our donors, our partners and their families, a happy Christmas. We wish you all the best for the new year. Keep safe and well and we will see you in 2018. That which does not kill us….. Team 3 has returned from a difficult trip to Timor Leste this month. The team leader, Dr Wayne Pearson, says that he found it difficult to write a positive report; hence, the tardiness of this update. In addition to Wayne, the Australian contingent of Team 3 consisted of Dr Karen Sloan, Sally Stephens and newbies, Dr Marius Mocke and Abbey Notley. 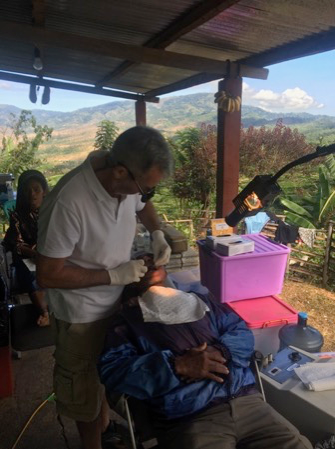 The Timorese component of the team consisted of Nico Pires (our in-residence dental therapist, Bony Cardoso Martins (friend, translator, fixer) and the redoubtable Sr Filomena. The team ran into their first problems with the airline, Airnorth before even leaving Australian soil. Airnorth’s system refused to recognise the TLDP’s current NGO status and so there were issues with the materials and equipment heading over. The team eventually sorted that out – money will fix almost anything. They arrived in Dili and were met by Judite and Mario, the Rotary Liaison team who handles much of the minutiae for many of the Rotary programs in TL. They liaise with customs to ensure that our dental gear gets through, pay bills for us, and deliver our car to the airport for us, which they keep safe when we were not in town. They are indispensable. The team then met with Bony, who advised them of the new registration required for foreign dentists volunteering in TL. As mentioned in the previous report, this involved a great deal of documentation – two statutory declarations in Tetum and Portuguese, a copy of the passport, two passport photos, a copy of the dental registration, a copy of the degree certificate, a curriculum vitae in Tetum and, of course, a fee of USD 25. This was to be presented in person to the Ministry of Health and then there would be a wait of two weeks for it to be processed, after which the dentist could carry out their volunteer duties. Logistical difficulties were immediately apparent to the team – our teams are only in TL for two weeks! Having arrived earlier in the week, Sally had already bought the team’s general supplies and they finally got to Maubara in time for dinner with Sr Filomena. The next day, instead of starting work, the whole team, plus Sr Filomena and Bony, trooped back to Dili for an interview with the Ministry of Health (MoH). As the team were already in TL and had their AHPRHA registration, Dr Jaõa Manuel, who is in charge of professional registration, gave the team a once-off permission to work in TL. However, the following teams would have to comply with the new rules. As a concession to our short visits, he said that documents could be sent over in advance, but Wayne pointed out that this would be difficult when there is no postal service to TL; in addition, having to translate the documents into 2 different languages might prove to be a big deterrent to volunteers. Dr Manuel agreed, but this was the will of the political arm of the MoH, so it must be complied with. It was decided that the documents would be sent over to Bony by Blanche via email; Bony would do the necessary translations and then deliver the documents to the MoH. The team seemed to have arrived at a workable solution that the MoH was happy with. Disaster averted, the team had a well-earned lunch at Black Rock in Cameo Beach, Liquiça. The remainder of the week was taken up by a clinic in Guiço, and a couple of days in Klinik Maubara. Karen, Marius and Abbey spent a lot of time with Nico, honing his diagnostic skills; this is of prime importance, as most of the time he has no one else to seek advice. Sally spent a great deal of time sorting out the stores – the MoH has also developed stricter protocols on materials. On top of his clinical tasks, Wayne attended to maintenance, reconstructing the suction unit with the reconditioned motor which Blanche dismantled earlier this year. Wayne and Sr Filomena were summoned to the MoH again, this time to meet with the official who’s jurisdiction includes Atauro. This official told Wayne that he needed to provide her with an official letter so she could inform the people that they were coming. Despite assurance that, in fact, our visit had been planned a year ago with the local Atauro health authority, that Sr Filomena had been in close communication with the Director of the Hospital in Atauro, and that the people already knew the team was coming, a letter was demanded by close of business the next day. This necessitated a return to Maubara, where Sr Filomena produced a very official letter, with lots of stamps and signatures, and a quick return to Dili by motorcycle by Nico by 1pm on Friday. The week was rounded off by dinner at the orphanage where, like so many of us before, the team was charmed and entertained by the Sisters’ young charges. All of us are no stranger to the upwelling of maternal feelings during these visits, but apparently, Abbey was particularly affected by the experience. Saturday saw the team off to Atauro. In true Timorese fashion, boarding the vessel was colourful chaos. Although passenger tickets are available the day before, vehicle tickets are only purchasable on the day of departure – and even with a ticket, there is no guarantee of getting on board. The team had to hustle to fit both vehicles with all the gear onto the boat – Sister’s car was the second last car on! At least one other vehicle was turned away. The trip over was otherwise uneventful and the team arrived, unscathed, at Barry’s Place which, as always, was simultaneously a hive of activity and an oasis of peace. This time they were hosting a TEDX talk in the dining area! After meeting the local administrator, Mr Lucas, and hammering out a few details, the team was then free to soak off the frustrations of the previous week over the remainder of the weekend. The team set up in the Vila hospital for the first 3 days and they were kept busy as usual. They had few problems with the equipment – only a dicky chair with a threaded screw, which they jury-rigged with a strap. They even had lights and a fan from Day 2 after paying for some fuel for the hospital generator on Day 1. The final two days they went up the hill to Biquelli for 2 days. Here there was a lot more work, as these people have never had a dental service. They were ably assisted by Mr Lucas and a young German volunteer, Fransiska, who both helped with translation and reassuring patients. Timor is amazing in that way – one gets random help from everywhere. THANKYOU. An especially BIG thank you to Bony for his continued trips to above and beyond for this program. We would be a dead duck in the water if not for him. Thank you to Nico for his excellent work ethic and his willingness to learn from us and to take on the responsibility of the clinic. Thank you to Karen and Sal for the hard slog in the storeroom and to Karen for taking Nico under her wing. Thank you to Marius and Abbey for throwing your effort into the team – it’s a hard place to work. Thank you to Barry for his organisational skills and support for our teams in Atauro. Last, but not least, thank you to Henry Schein Halas for continuing to support out work with much needed materials. We appreciate it. No pics at the moment, folks – its slow going!